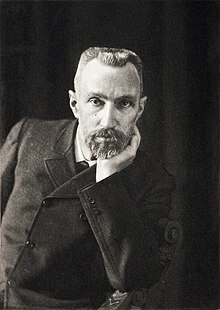 Pierre Curie (/ˈkjʊəri/; French: [kyʁi]; 15 May 1859 – 19 April 1906) was a French physicist, a pioneer in crystallography, magnetism, piezoelectricity and radioactivity. In 1903, he received the Nobel Prize in Physics with his wife, Marie Skłodowska-Curie, and Henri Becquerel, "in recognition of the extraordinary services they have rendered by their joint researches on the radiation phenomena discovered by Professor Henri Becquerel". Born in Paris on 15 May 1859, Pierre Curie was the son of Eugene Curie (28 August 1827 – 25 February 1910), a doctor of French Huguenot Protestant origin from Alsatia, and Sophie-Claire Depouilly Curie (15 January 1832 – 27 September 1897). He was educated by his father and in his early teens showed a strong aptitude for mathematics and geometry. When he was 16, he earned his math degree. [clarification needed] By the age of 18, he had completed the equivalent of a higher degree, but did not proceed immediately to a doctorate due to lack of money. Instead he worked as a laboratory instructor. When Pierre Curie was preparing for his bachelor of science degree, he worked in the laboratory of Jean-Gustave Bourbouze in the Faculty of Science. In 1880 Pierre and his older brother Jacques (1856–1941) demonstrated that an electric potential was generated when crystals were compressed, i.e. piezoelectricity. To aid this work they invented the piezoelectric quartz electrometer. The following year they demonstrated the reverse effect: that crystals could be made to deform when subject to an electric field. Almost all digital electronic circuits now rely on this in the form of crystal oscillators. In subsequent work on magnetism Pierre Curie defined the Curie scale. This work also involved delicate equipment - balances, electrometers, etc. 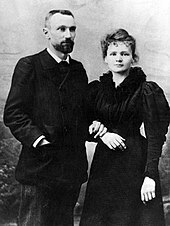 Pierre Curie was introduced to Maria Skłodowska by their friend, physicist Józef Wierusz-Kowalski. Curie took her into his laboratory as his student. His admiration for her grew when he realized that she would not inhibit his research. He began to regard Skłodowska as his muse. She refused his initial proposal, but finally agreed to marry him on 26 July 1895. Prior to his famous doctoral studies on magnetism, he designed and perfected an extremely sensitive torsion balance for measuring magnetic coefficients. Variations on this equipment were commonly used by future workers in that area. Pierre Curie studied ferromagnetism, paramagnetism, and diamagnetism for his doctoral thesis, and discovered the effect of temperature on paramagnetism which is now known as Curie's law. The material constant in Curie's law is known as the Curie constant. He also discovered that ferromagnetic substances exhibited a critical temperature transition, above which the substances lost their ferromagnetic behavior. This is now known as the Curie temperature. The Curie temperature is used to study plate tectonics, treat hypothermia, measure caffeine, and to understand extraterrestrial magnetic fields. Pierre Curie formulated what is now known as the Curie Dissymmetry Principle: a physical effect cannot have a dissymmetry absent from its efficient cause. For example, a random mixture of sand in zero gravity has no dissymmetry (it is isotropic). Introduce a gravitational field, and there is a dissymmetry because of the direction of the field. Then the sand grains can 'self-sort' with the density increasing with depth. But this new arrangement, with the directional arrangement of sand grains, actually reflects the dissymmetry of the gravitational field that causes the separation. Curie worked with his wife in isolating polonium and radium. They were the first to use the term "radioactivity", and were pioneers in its study. Their work, including Marie Curie's celebrated doctoral work, made use of a sensitive piezoelectric electrometer constructed by Pierre and his brother Jacques Curie. Pierre Curie's 1898 publication with his wife Mme. 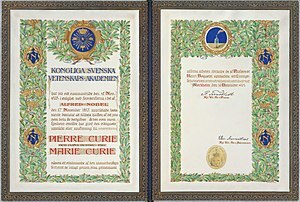 Curie and also with M. G. Bémont for their discovery of radium and polonium was honored by a Citation for Chemical Breakthrough Award from the Division of History of Chemistry of the American Chemical Society presented to the ESPCI ParisTech (officially the École supérieure de physique et de chimie industrielles de la Ville de Paris) in 2015. Curie and one of his students, Albert Laborde, made the first discovery of nuclear energy, by identifying the continuous emission of heat from radium particles. Curie also investigated the radiation emissions of radioactive substances, and through the use of magnetic fields was able to show that some of the emissions were positively charged, some were negative and some were neutral. These correspond to alpha, beta and gamma radiation. In the late nineteenth century, Pierre Curie was investigating the mysteries of ordinary magnetism when he became aware of the spiritualist experiments of other European scientists, such as Charles Richet and Camille Flammarion. Pierre Curie initially thought systematic investigation into the paranormal could help with some unanswered questions about magnetism. :65 He wrote to his fiancée Marie: "I must admit that those spiritual phenomena intensely interest me. I think in them are questions that deal with physics. ":66 Pierre Curie's notebooks from this period show he read many books on spiritualism. :68 He did not attend séances such as those of Eusapia Palladino in Paris in 1905–6:238 as a mere spectator, and his goal certainly was not to communicate with spirits. He saw the séances as scientific experiments, tried to monitor different parameters, and took detailed notes of every observation. 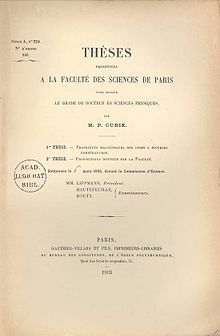 :247 Despite studying spiritualism, Curie was an atheist. Pierre and Marie Curie's daughter, Irène, and their son-in-law, Frédéric Joliot-Curie, were also physicists involved in the study of radioactivity, and each received Nobel prizes for their work as well. The Curies' other daughter, Ève, wrote a noted biography of her mother. She was the only member of the Curie family to not become a physicist. Ève married Henry Richardson Labouisse, Jr., who received a Nobel Peace Prize on behalf of Unicef in 1965. Pierre and Marie Curie's granddaughter, Hélène Langevin-Joliot, is a professor of nuclear physics at the University of Paris, and their grandson, Pierre Joliot, who was named after Pierre Curie, is a noted biochemist. Pierre Curie died in a street accident in Paris on 19 April 1906. Crossing the busy Rue Dauphine in the rain at the Quai de Conti, he slipped and fell under a heavy horse-drawn cart. He died instantly when one of the wheels ran over his head, fracturing his skull. Statements made by his father and lab assistant imply that Curie's characteristic absent-minded preoccupation with his thoughts contributed to his death. Both the Curies experienced radium burns, both accidentally and voluntarily, and were exposed to extensive doses of radiation while conducting their research. They experienced radiation sickness and Marie Curie died of aplastic anemia in 1934. Even now, all their papers from the 1890s, even her cookbooks, are too dangerous to touch. Their laboratory books are kept in special lead boxes and people who want to see them have to wear protective clothing. Had Pierre Curie not been killed as he was, it is likely that he would have eventually died of the effects of radiation, as did his wife, their daughter, Irène, and her husband, Frédéric Joliot. In April 1995, Pierre and Marie Curie were moved from their original resting place, a family cemetery, and enshrined in the crypt of the Panthéon in Paris. Marie Curie was the first woman to be honored in this way "for her own merits". ^ Jones, Daniel (2011). Roach, Peter; Setter, Jane; Esling, John (eds.). Cambridge English Pronouncing Dictionary (18th ed.). Cambridge University Press. ISBN 978-0-521-15253-2. ^ a b "The Nobel Prize in Physics 1903". NobelPrize.org. Retrieved 8 July 2016. ^ a b c d Quinn, Susan (1996). Marie Curie : a life. Reading, Mass. : Addison-Wesley. ISBN 978-0201887945. ^ a b "This Month in Physics History: March 1880: The Curie Brothers Discover Piezoelectricity". ACS News. March. 2014. Retrieved 8 July 2016. ^ Molinié, Philippe; Boudia, Soraya (May 2009). "Mastering picocoulombs in the 1890s: The Curies' quartz–electrometer instrumentation, and how it shaped early radioactivity history". Journal of Electrostatics. 67 (2–3): 524–530. doi:10.1016/j.elstat.2009.01.031. Retrieved 8 July 2016. ^ Manbachi, A. and Cobbold R.S.C. (November 2011). "Development and Application of Piezoelectric Materials for Ultrasound Generation and Detection". Ultrasound. 19 (4): 187–196. doi:10.1258/ult.2011.011027. Archived from the original on 22 July 2012. ^ Kürti, N.; Simon, F. (1938). "LXXIII. Remarks on the "Curie" scale of temperature". The London, Edinburgh, and Dublin Philosophical Magazine and Journal of Science. 26 (178): 849–854. doi:10.1080/14786443808562176. ^ Nobel Lectures, Physics 1901-1921, Elsevier Publishing Company, Amsterdam, 1967. ^ Redniss, Lauren (2011). Radioactive. New York, New York: HarperCollins. p. 26. ^ Redniss, Lauren (2011). Radioactive. New York, New York: HarperCollins. p. 33. ^ Estreicher, Tadeusz (1938). Curie, Maria ze Skłodowskich (in Polish) (vol. 4 ed.). In Polski słownik biograficzny. p. 111. ^ Goldsmith, Barbara (16 May 2011). Obsessive Genius: The Inner World of Marie Curie (Great Discoveries). W. W. Norton & Company. ISBN 9780393079760. ^ Redniss, Lauren (2011). Radioactive. New York, New York: HarperCollins. p. 30. ^ Castellani, Elena; Ismael, Jenann (16 June 2016). "Which Curie's Principle?" (PDF). Philosophy of Science. doi:10.1086/687933. Retrieved 8 July 2016. ^ Berova, Nina (2000). Circular dichroism : principles and applications. New York, NY: Wiley-VCH. pp. 43–44. ISBN 0471330035. Retrieved 8 July 2016. ^ "Marie and Pierre Curie and the Discovery of Polonium and Radium". Nobelprize.org. 2014. ^ P. Curie, Mme. P. Curie, and M. G. Bémont, Comptes Rendus de l'Académie des Sciences, Paris, 1898 (26 December), vol. 127, pp. 1215-1217. ^ Abbott, Steve; Jensen, Carsten; Aaserud, Finn; Kragh, Helge; Rudinger, Erik; Stuewer, Roger H. (July 2000). "Controversy and Consensus: Nuclear Beta Decay 1911-1934". The Mathematical Gazette. 84 (500): 382. doi:10.2307/3621743. Retrieved 9 July 2016. ^ Lagowski, Joseph J. (1997). Macmillan encyclopedia of chemistry. 2. New York: Macmillan Reference USA. p. 1293. ISBN 0028972252. ^ Paul W. Frame. "How the Curie Came to Be". Retrieved 30 April 2008. ^ a b c d e Hurwic, Anna (1995). Pierre Curie, Translated by Lilananda Dasa and Joseph Cudnik. Paris: Flammarion. ISBN 9782082115629. ^ Warren Allen Smith (2000). Who's who in hell: a handbook and international directory for humanists, freethinkers, naturalists, rationalists, and non-theists. Barricade Books. p. 259. ISBN 9781569801581. Retrieved 4 February 2017. Curie, Pierre (1859—1906) A codiscoverer of radium, Pierre Curie was an atheist. ^ "The Nobel Prize in Chemistry 1935: Frédéric Joliot, Irène Joliot-Curie". Nobel Foundation. 2008. Retrieved 4 September 2008. ^ Curie, Eve (1937). Madame Curie. London: William Heinemann. ^ Fox, Margalit (25 October 2007). "Eve Curie Labouisse, Mother's Biographer, Dies at 102". The New York Times. Retrieved 9 July 2016. ^ Smith, Warren Allen (2000). "Curie, Pierre (1859—1906)". Who's who in hell : handbook and international directory for humanists, freethinkers, rationalists, and non-theists. New York: Barricade Books. p. 259. ISBN 9781569801581. ^ "Hélène Langevin-Joliot: A Granny, More Than a Physicist". Peking University News. 19 May 2014. Retrieved 9 July 2016. ^ Mould, R.F. (2007). "Pierre Curie, 1859–1906". Current Oncology. 14 (2): 74–82. doi:10.3747/co.2007.110. PMC 1891197. PMID 17576470. ^ Tasch, Barbara (31 August 2015). "These personal effects of 'the mother of modern physics' will be radioactive for another 1500 years". Business Insider. Retrieved 9 July 2016. ^ Redniss, Lauren (2010). Radioactive : Marie And Pierre Curie : a tale of love and fallout (1st ed.). New York: HarperEntertainment. ISBN 978-0061351327. ^ Bartusiak, Marcia (11 November 2011). ""Radioactive: Marie & Pierre Curie — A Tale of Love and Fallout" by Lauren Redniss". The Washington Post. Retrieved 9 July 2016. ^ "Marie Curie Enshrined in Pantheon". The New York Times. 21 April 1995. Retrieved 9 July 2016. ^ ""Matteucci" Medal". Accademia Nazionale delle Scienza. Archived from the original on 7 March 2016. Retrieved 9 July 2016.